In the Willamette Valley, the peak nectar flow is over early. The bees are still finding forage, but we recommend you take off the honey supers and let the bees build up stores for winter. Another benefit of taking supers off now is that it is warmer. This makes the extracting process so much easier. Once you have removed honey supers, consider doing a mite treatment. Don't procrastinate; the mite population is typically high this time of year, and there are natural treatment options available. It seems just wrong to feed bees in Summer. But this year, and the past few years have seen inconsistent nectar flow. Some hives are doing well and others, while still strong, are very light in food stores. Rather than feeding the light colonies, you combine them with heavy colonies. This is not a bad strategy. If it is not a viable option, you could just hope they catch up on their deficit in food storage, and if they don't, then let nature take its course--survival of the strong. If you can't stand the thought of the light colony starving over winter, this is the time to start feeding sugar syrup and a pollen patty or Amino-B. Check their weight once a week by tilting the lower box forward at the back cup handle. 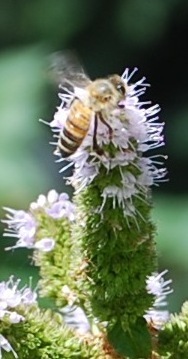 Conventional wisdom is that in the Willamette Valley, you should pull honey supers at the beginning of August. First time I heard this many years ago from an old beekeeper, I thought it was ridiculously early. After all, plenty of nectar is available in August. Yes, it tends to make darker honey, coming from the more drought tolerant plants and "weeds," but this just makes the flavor more interesting. But there are at least two good reasons why the old beekeeper was right, and I was wrong: First, it pays dividends to get at least one more mite treatment in while the colony is still near peak population, since the mites are also likely to be riding the population wave of the colony. Second, it pays to give the colony time to get in the last of their winter stores. This is particularly important if the nectar flow has been light. So avoid the vice of greed, and pull the supers reasonably early in August, and start the mite treatments. With the blackberry nectar flow already started, new beekeepers may be wondering whether to bother adding a honey super to their new hive. Well, they shouldn't expect to get a lot of honey from a first-year hive, but putting on a honey super might be worthwhile for a couple of reasons apart from the honey potential. First, it tends to reduce crowding during the peak population time, and thus reduces swarm risk. Second, even if the bees don't make much honey, they will likelyl build out the honey comb. This give the colony a great start for next year's honey season. Besides, there is always someone who does incredibly well on their first season. And it might be you. Your new package bees should have plenty of brood by now, and it should be in a tight pattern. Depending when you got you bees, they might be ready for a second hive box. If not, they will be soon. Beekeepers using 8-frame boxes, Warre boxes, or western supers will all need to put their brood chamber expansion boxes on sooner than those using 10-frame deep boxes. If your colony is not expanding, look for worker brood on the comb, and look for queen cells toward the center of the frame. If no worker brood, and if you see queen cells in the middle of the frame (as opposed to the bottom of the frame, you might have a failed queen.) you will need to re-queen immediately. Don't stop feeding your package bees if you live in the Northwest. You should see a solid brood pattern on the center the combs of the installed package colonies by now, assuming you got your bees in the last couple of weeks. If you got them earlierr the brood should spread across several combs. If the brood has a scattered pattern, showing lots of empty cells, put the hive on your list for another inspection soon. It might need a new a new queen. The ideal brood is dense and only has a few empty cells showing. By the way, when doing your hive inspection, once you see one comb dense with brood, you can reasonably assume the colony is doing well, and stop the inspection at that point. No need to rummage through all the combs unless you have good reason to. If you picked up new bees recently, either as packages or nucleus hives, it is crucial that you feed them. Package bees do not have enough stores to survive until the main nectar flow. Nucleus hives likely have some stores, not enough to last until the main nectar flow is under way. Use sugar syrup of at least 1 part sugar to 1 water, and a pollen substitute. With this warm spring weather in the Willamette Valley, this is a good time to check out your hive. If you are not seeing much activity at the hive entrance in this warm weather, it might be time to take a look inside. If you do open up the hive, make sure the outside temperature is above 50 degrees Fahrenheit and try to do it in the early afternoon, when the hive is warmest. If you find from your inspection that the hive is failing, it is not too late to order package bees, but you need to get your order in soon. If you are running your winter hive with just a regular inner cover and outer cover, consider adding a Ruhl Bee Vivaldi Board with burlap inside it as a means to wick up the moisture created by the colony and to add thermal insulation. A good alternative is to place a honey super above the inner cover and place the insulating material, such as burlap, inside it. You won't get the ventilation benefit of the Vivaldi board but you will have room to add more burlap. Well, after a big hiatus from blogging, we return. We have recently been busy at two Northwest bee conferences, one in Washington State, and the other in Oregon. Both had great speakers over a wide range of topics. Thanks to both the Washington State Beekeepers Association and the Oregon State Beekeepers Association for putting on these richly rewarding events. On a different topic, those of you who have not done any winter prep for your hives can still do something to help them through winter. With this cool autumn weather, we hate tearing into hives, but you can at least make sure the colony is well protected from driving wind and rain. And make sure the hive is not sitting directly on the ground. You can test the hive weight by lifting the lower box cup handle. If light, either combine it with another colony or feed. In our area, our bees are taking less sugar syrup now, but they will slowly nibble away at a candy board or Drivert sugar. If you decide to use an entrance reducer for winter, make sure to remove it regularly to clean the bottom board of dead bees. Sometimes the winter attrition can sharply increase after a sudden temperature drop. This can block the entrance on the inside, which can cause serious problems for the colony. If you find one of your colonies has completely died out, don't leave the boxes out all winter. Clean them thoroughly now and store them in a dry place, ready for more bees next spring.